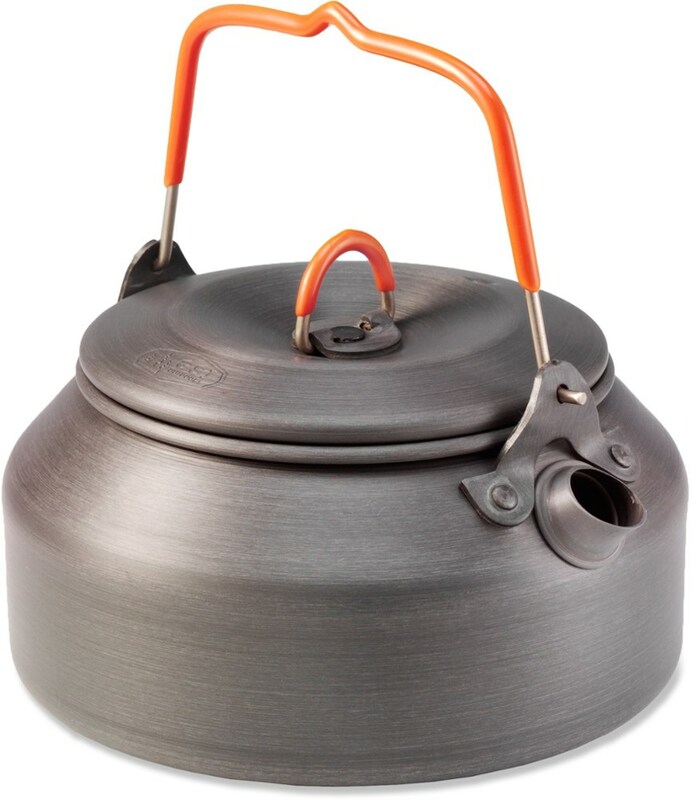 Super lightweight, 700ml pot/lid combo, designed for use as a cup or a gram counting, solo kettle. 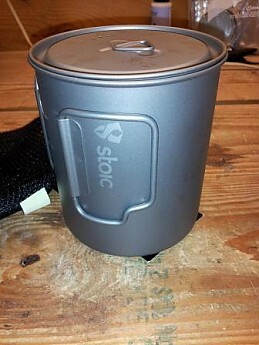 This pot/lid combo is manufactured by Stoic. It's made of titanium making it uber lightweight and the best thing is the price. This kettle can be had for $19.99. 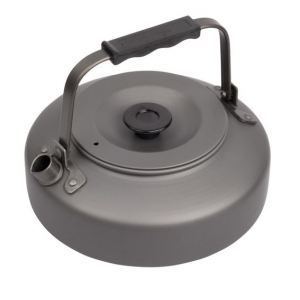 Another ti product made by Snow Peak, which is comparable to the Stoic kettle, comes in at a price of $39.95. I received the kettle packed in a cardboard box. 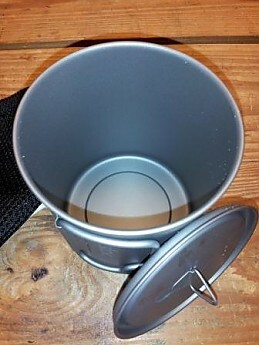 The kettle itself was contained in a small plastic bag inside the mesh sack. A cardboard tag with the company's logo was hanging from the drawcord. Now the details: The weights were measured with a digital nutrition scale. The pot weighs 3.4 oz, lid .6 oz, mesh sack .5 oz for a total weight of 4.5 oz. 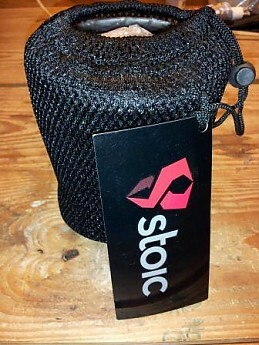 The stretch nylon mesh stuffsack is sturdy and secured with a drawcord and cordlock. It seems to be more like a double layer jersey knit mesh which also adds a bit of cushioning for the kettle. The lid on this kettle is not attached nor is there a way to attach it. There are two handles which fold flat against the kettle when they are not in use. The kettle easily fits over the end of a Nalgene bottle. 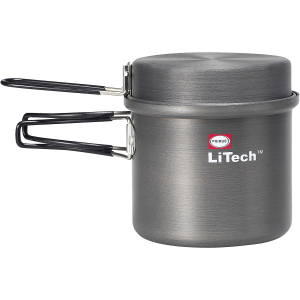 A small stove and one of those tiny 110gr Gigapower canisters will nest in the pot. I've boiled water in it for coffee and dehydrated meals. I've used it for just drinking water. As with all titanium, it should not be used on an open flame like a campfire or Esbit stove as it will discolor the metal. I have an Esbit stove and when I use it, a stainless steel canteen cup is my go to pot. Boil times are similar to aluminum. 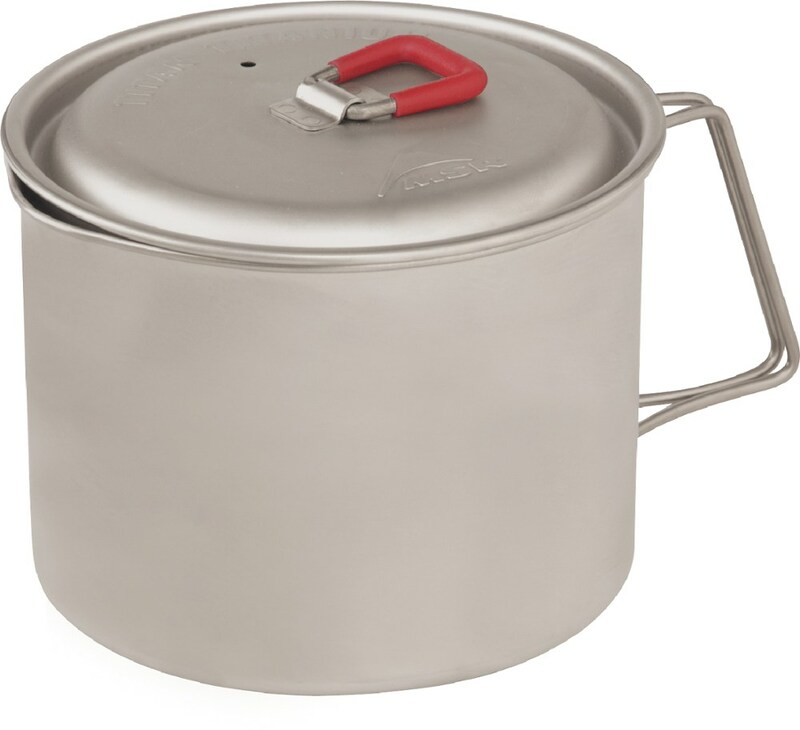 This is primarily used with a canister stove but I've tried it with a small cat can alcohol stove. The only problem I saw with that setup was the flame exceeded the diameter of the cup slightly, so the flames were on the outside of the cup and that could hamper the time it takes to boil water. The handles were too hot to touch also due to the flame touching them. I won't knock down the rating because of not being able to use it on an open flame. That's not a fault of the titanium itself. There are other materials like aluminum, steel or cast iron which can be used to cook over an open flame. The exotic metals should be saved for the canister stove. See the bend in the handle? Your pinky finger will fit there just right when you hold the cup. For my uses this kettle fits the bill. 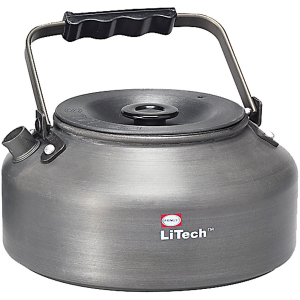 It's superlight, doesn't take up much space in the pack which makes it easy to carry along and have a way to heat water for afternoon tea, coffee or a trail meal. Plus, did I mention the price? 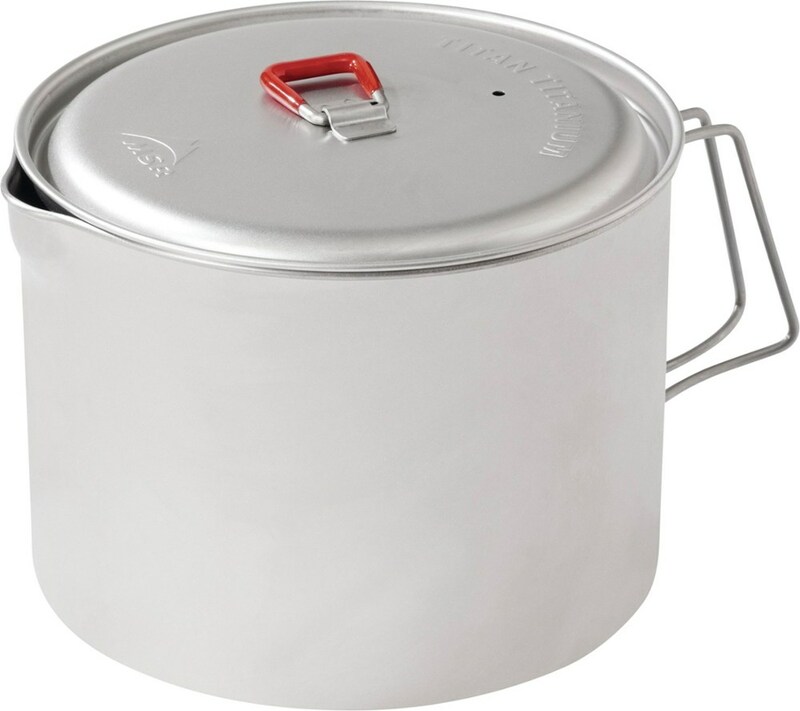 If you were considering purchasing titanium cookware and were on the fence due to the price, this pot puts itself in reach of the masses. Go get one! 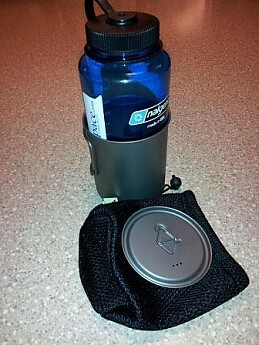 Holds a Nalgene bottle, very lightweight. A very durable piece of gear! Has foldable handles, stores very compact. Only weighs 4.1 oz for the UL hiker. Titanium very durable and no aluminum taste! I love this pot because of the durability and the minimal weight! Also this pot is very small but can also hold a Nalgene or my alcohol stove, windscreen, and flint and steel. 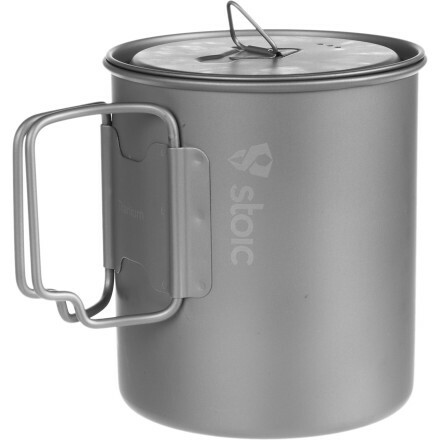 The Stoic Ti Kettle is not available from the stores we monitor. It was last seen December 5, 2012	at Backcountry.com.